When I'm invited to an event that allows me to bring any of my kids, it really gets me excited. That means sharing a unique experience with my kids while also enjoying the company of my friends. 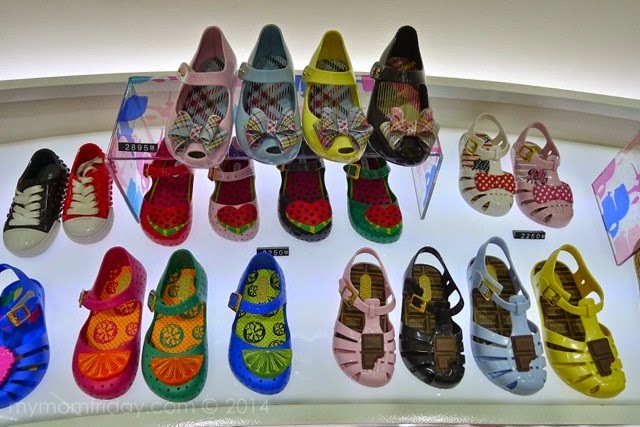 That's what happened during the launch of Mini Melissa footwear recently. I love shoes (who doesn't?) and I love my pointy red flocked Melissa shoes. 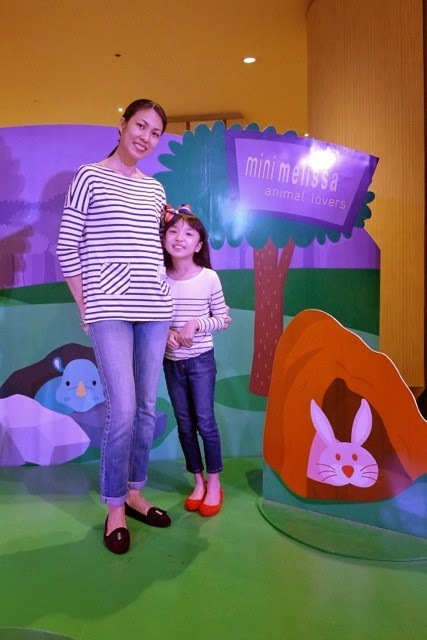 I know my girl will have fun discovering Mini Melissa at this mom-and-me event! 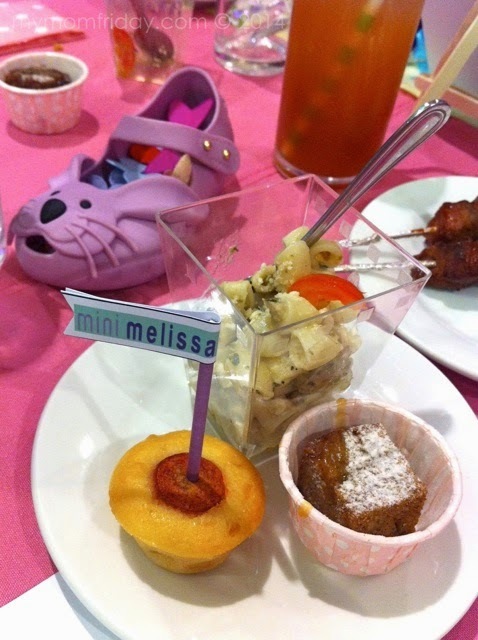 The cocktail party of Mini Melissa was held at the East Wing of Shangri-la mall in front of Geléia store where you can buy Melissa shoes. 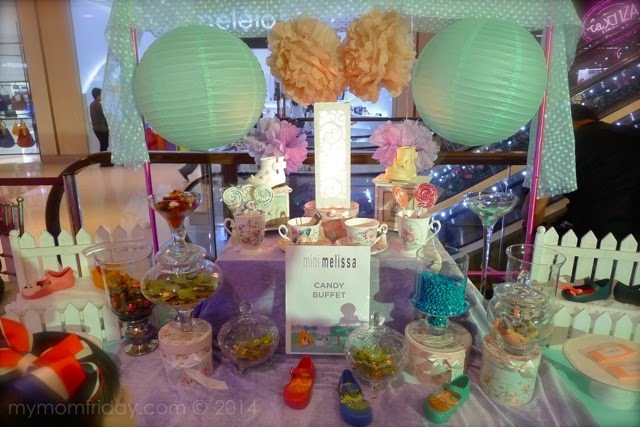 The colorful party featured a candy buffet that the little girls, even moms, can't stay away from! Aside from the yummy desserts and hors d'oeuvres, there was a mini program prepared for the guests, but we missed it since we arrived late. All the moms came in matching outfits with their girls so it was really cute to see everyone dressed in coordinating looks. Anyhow, my girl was still able to make the passport craft kit and went on a sugar high with all the sweets she can handle! =) The most important thing was being able to see the complete collection of Mini Melissa. 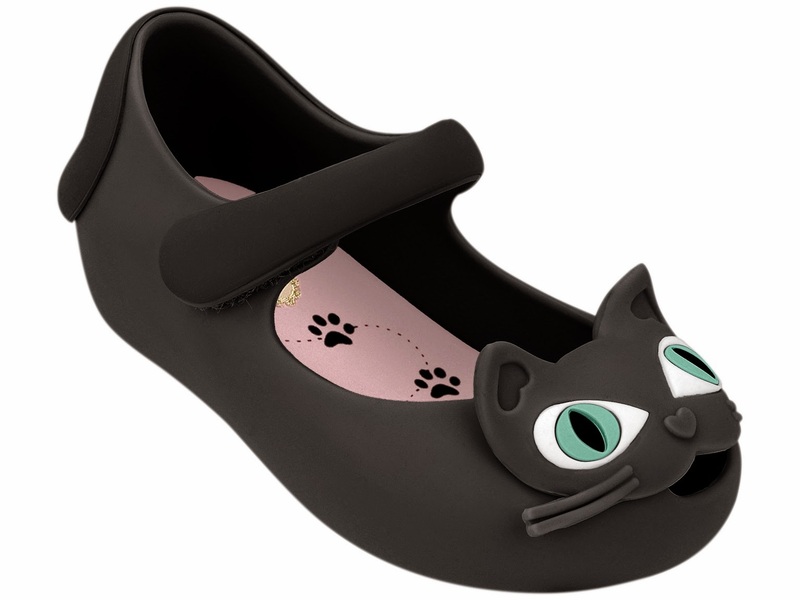 Mini Melissa is a whimsical line of comfortably stylish footwear for girls one to five years old. 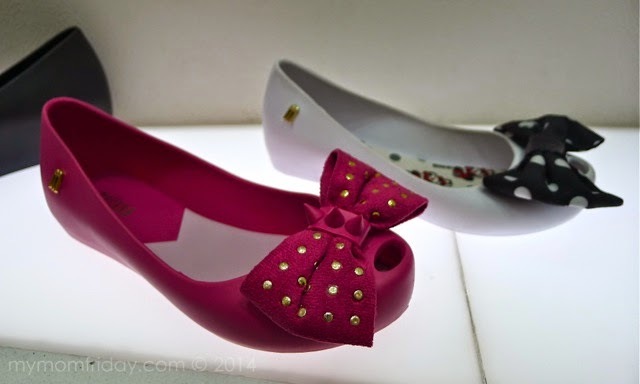 Launched in 2010, Mini Melissa shares the same design philosophy as its mother brand, Melissa, which originates from Brazil. 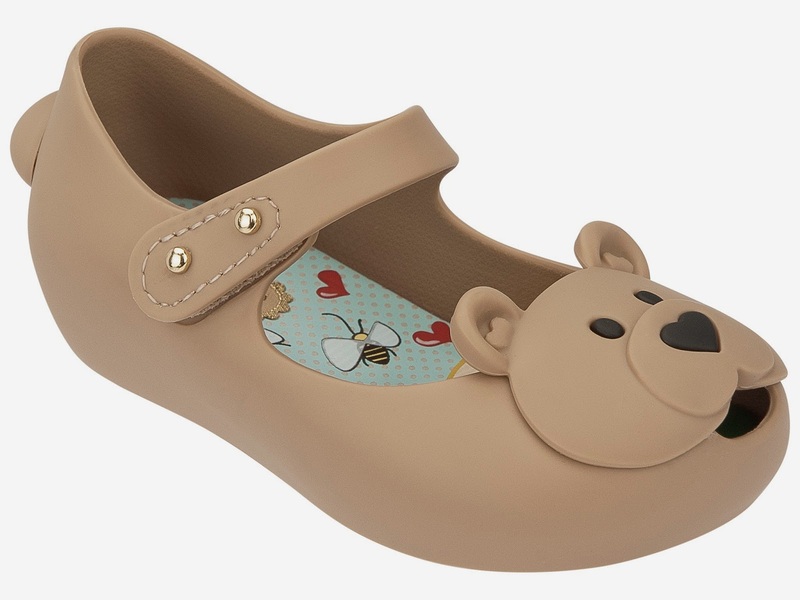 The shoes are made from sustainable, non-toxic, hypoallergenic thermoplastic that make them very comfortable, even for fragile tiny feet. Each pair is deliciously scented with Melissa’s signature fruity fragrance. Practical, stylish, and durable. 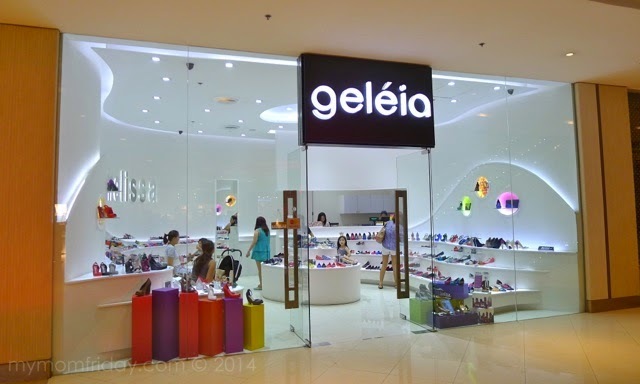 I was with fellow blogging moms and their daughters that afternoon and we were ushered to the Geléia store to pick our own Melissa shoes. Woohoo! Too much eye candy in the store -- so difficult to choose from the many pretty styles and colors! Visit the store and you'll know what I mean. 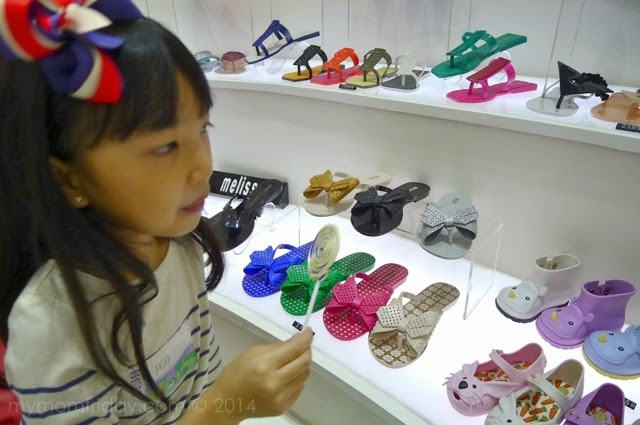 First on the agenda: M gets to pick a pair of Mini Melissa. Looking, looking, looking (while licking a lollipop)! The Mini Melissa + Vivienne Westwood collab has resulted in this chic Anglomania design with preppy plaid bows! 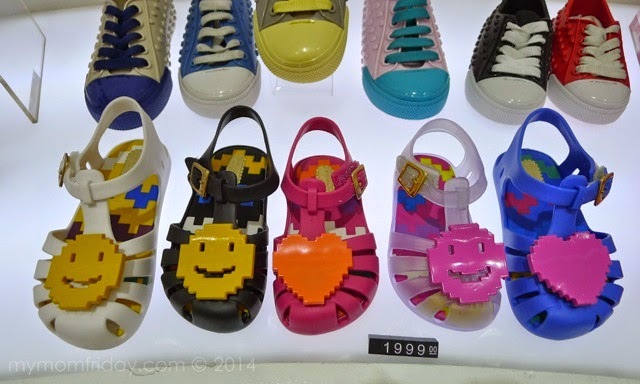 My girl plays video games so these pixel hearts and smiley faces caught her eye. 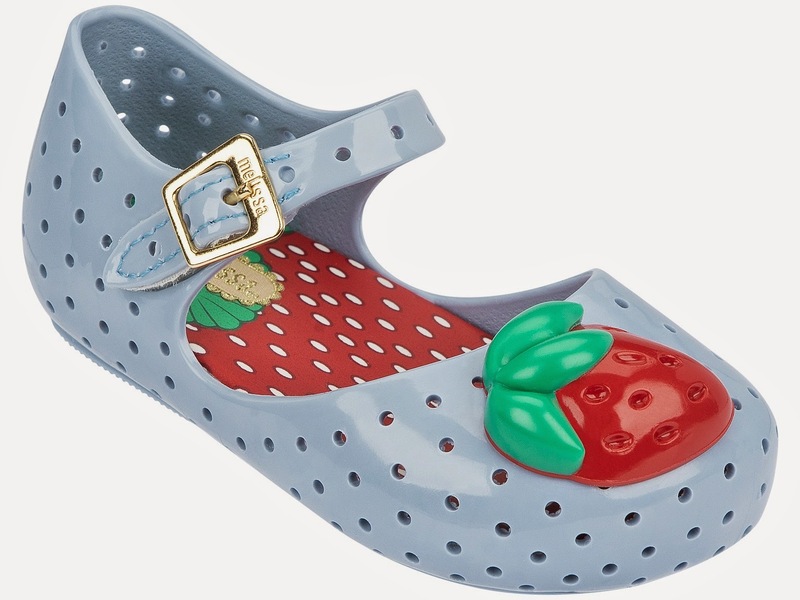 I think the neutral-colored Mini Melissa Aranha sandals with Smiley can actually be worn by toddler boys too, aside from the sneakers at the back. The Mini Melissas are too small for my girl's growing feet, so we went for the classic Melissa Ultragirl slip-ons with junior sizes. I actually wanted this Ultragirl Sweet Bow with spikes or Minnie Mouse Ultragirl with polkadot bow, perfect for little girls 5 and up. These were our choices before she decided on the classic red. She insisted on having this red flocked Melissa Ultragirl pair. Since Melissa and Mini Melissa don't have half sizes, we got the next size up. She wore it immediately! 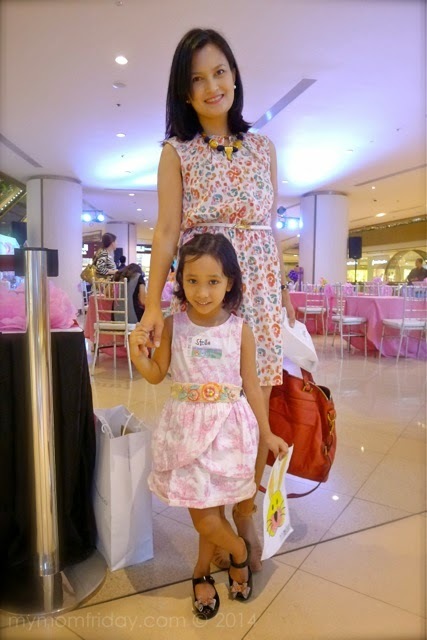 Before we started shopping, we were able to greet Melissa Philippines brand ambassador and stylish celebrity mom Daphe Oseña-Paez with her sweet Stella, who posed like a pro in her new Mini Melissa + Vivienne Westwood pair. 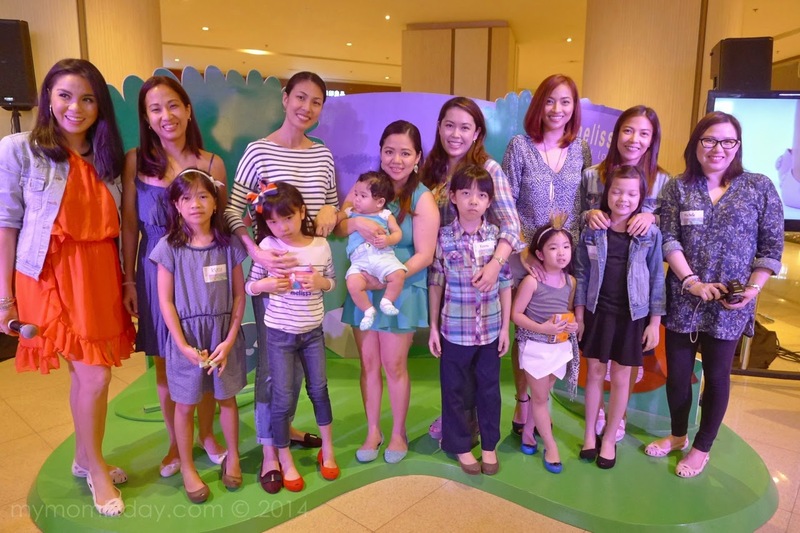 They came in matching floral-print dresses, while my girl and I garbed in our usual stripes and denim ensemble. Here are my personal picks from the new Mini Melissa collection which are now available in stores. Price ranges from PhP1,999 - 2,250. Most styles have convenient velcro straps. Choose from an array of bright hues or pastel colors from each design. 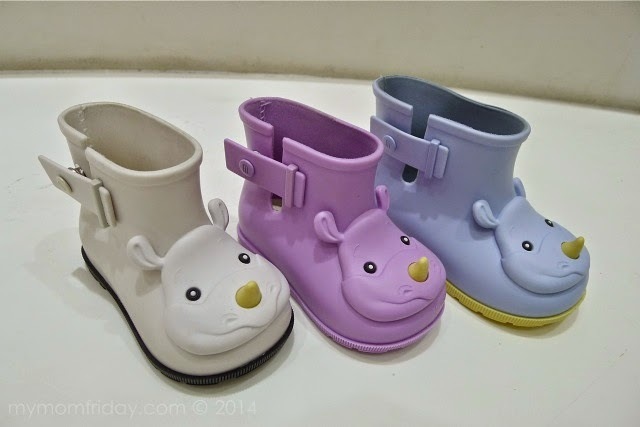 Mini Melissa Sugar Rhino Boots features a rhino face with a yellow horn, and snap enclosure on the side. Little boys can get comfy in these boots too! Mini Melissa Bear features a heart-shaped nose, little ears, and protruding tail. 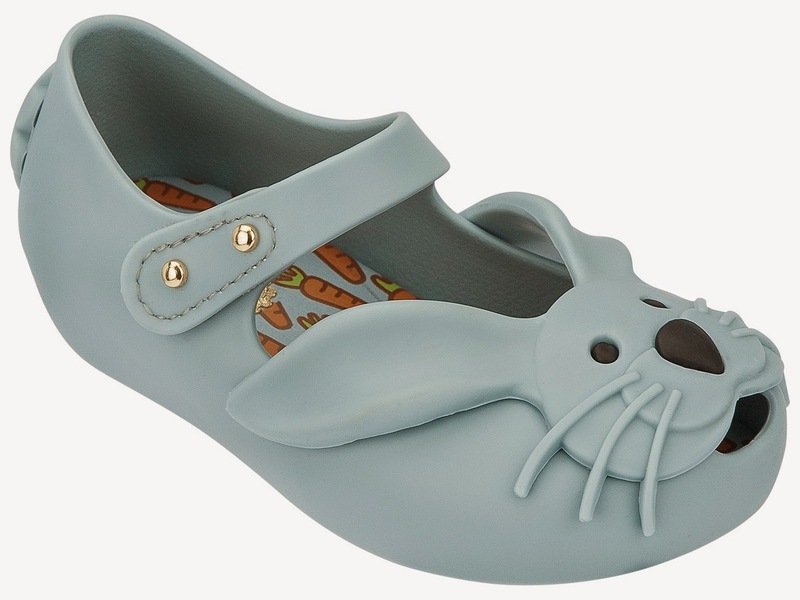 Mini Melissa Rabbit has long ears, whiskers, and a cute tail, with carrots-printed insoles. Mini Melissa Cat has big wide eyes, pointy ears, and tiny heart-shaped nose. 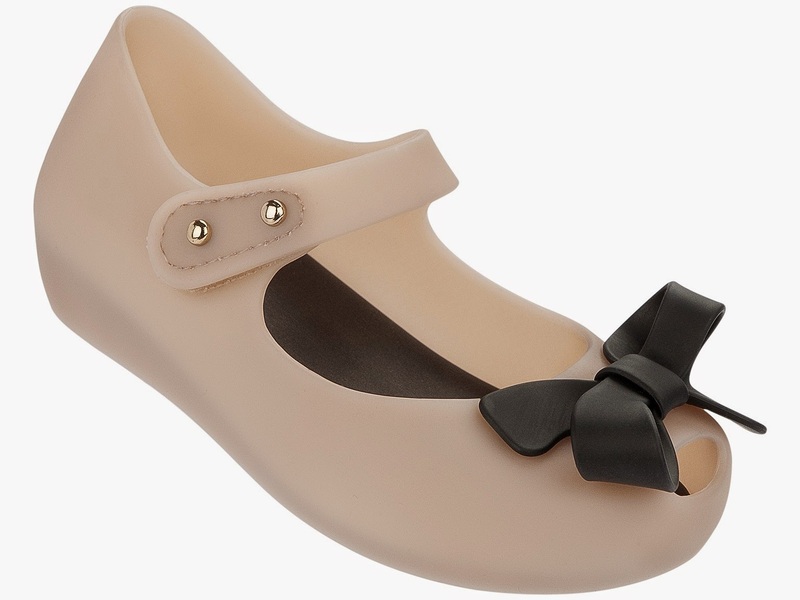 Mini Melissa Ultragirl Bow is classy, with color blocking and matte effect. 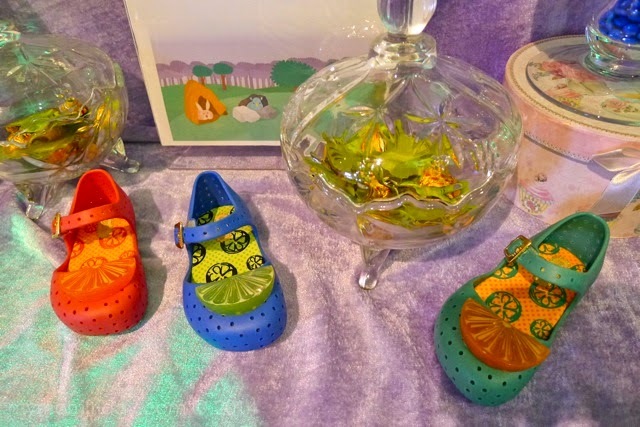 Mini Furadinha is a fun design with a fruit appliqué and punched out holes all around the shoe. 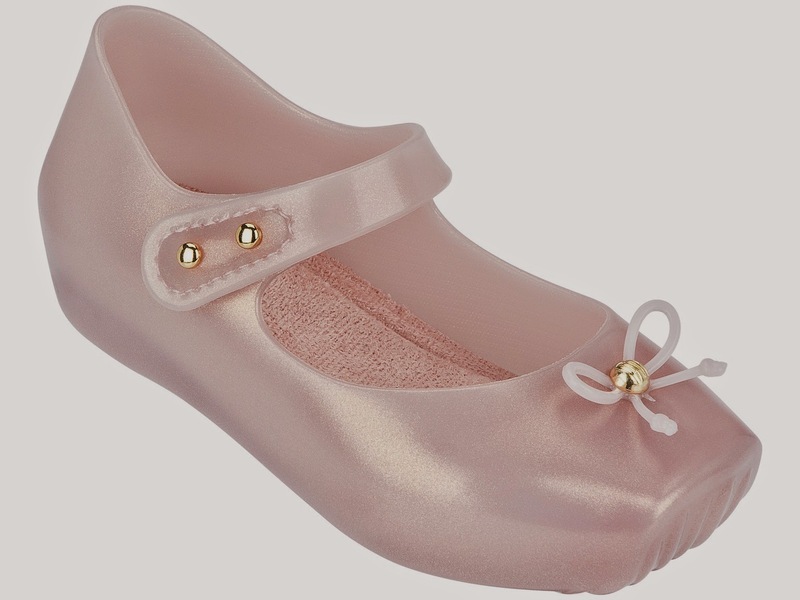 Mini Ballet is a dreamy pearlized shoe, inspired by a ballet pointe shoe, with soft cushy insole. Mini Ballet will be out this December. This will be a best-seller, for sure! 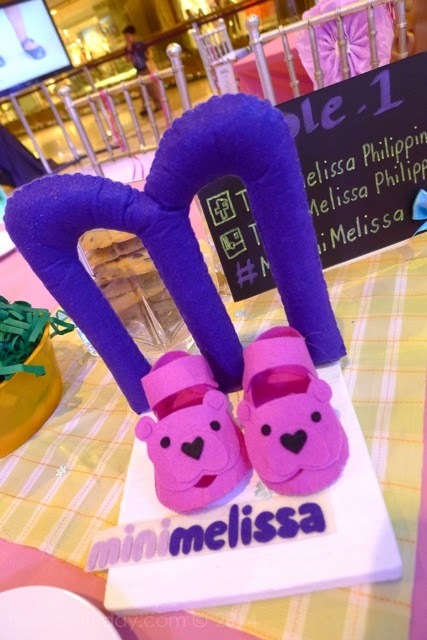 The moms did not leave without their own Melissa shoes as well. 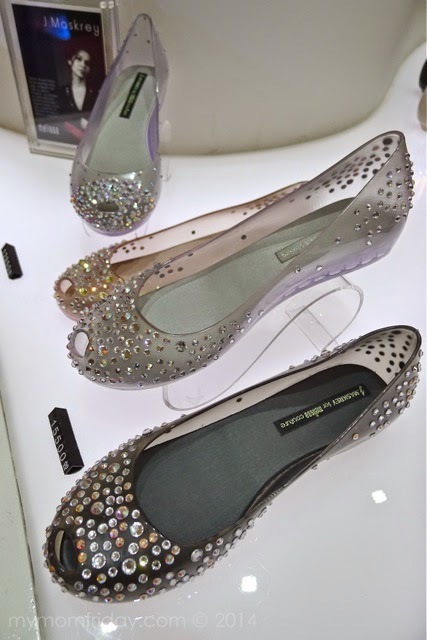 Melissa Artemis + Jason Wu, and luxe Melissa Ultragirl + J. Maskrey with Swarovski crystals! 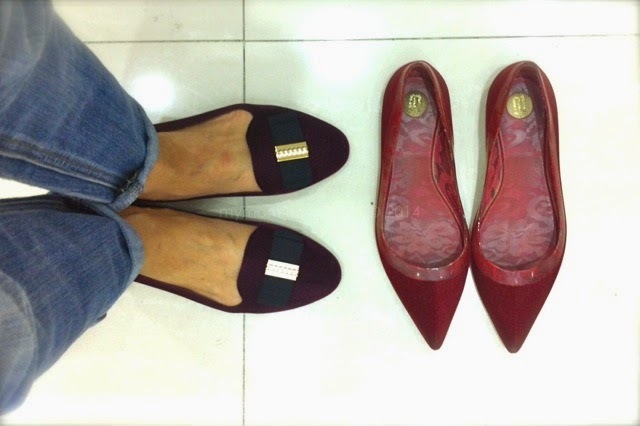 I chose this preppy Melissa Virtue + Jason Wu loafers in flocked bordeaux. I live in flats, and this pair makes a cool statement to my simple everyday wardrobe. My flocked Melissa shoes: new meets old (still in perfect condition after 5+ years). Women and shoes. It's always a happy combination! 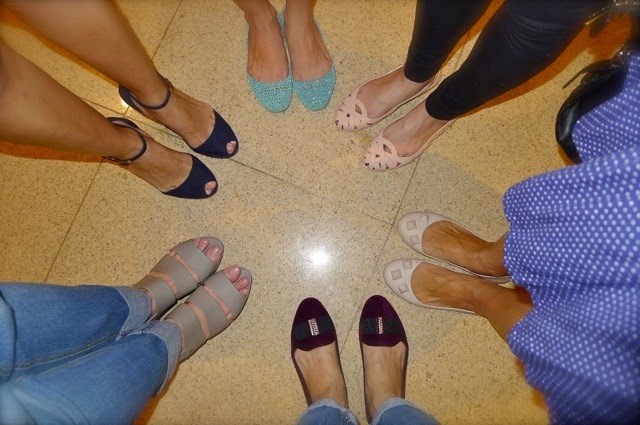 =) Thank you Melissa and Mini Melissa for a delightful afternoon and making us girls oh-so-happy with our new sweet-smelling shoes! Follow Melissa Philippines on Facebook for updates.